The idea of gourmet hot dogs may sound slightly anathema but if London can have a venue dedicated to hot dogs and Champagne there’s no reason why gourmet hot dog eateries should not exist. I suppose. Lunch with old work mates saw us wander into the Corn Exchange – one of Leeds’ most distinctive buildings and one that has seen its fortunes wane and wax. Happily, things are now in the waxing phase and once again it is looking and feeling vibrant and full of both shops and people. Primo’s Gourmet Hotdogs occupies a reasonable chunk of space on the ground floor level. The tables are reasonably tightly packed and on a Tuesday lunch we had no problems nabbing a seat. My mates were veterans and knew what to order without glancing at the menu. As it was a Cuban Tuesday Andy ordered a pulled pork Cubano with chips and a coffee for £4.95. I chose a Utah hot dog with an extra sausage (yes, the small, extra but very hungry mouth was in attendance). 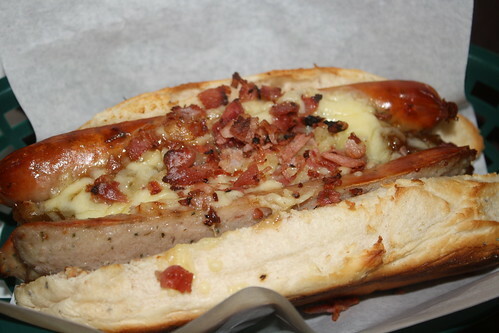 The Utah was offering me caramelised onions and crispy bacon and there are plenty of other variations on the hot dog theme. While vegetarians aren’t catered for with the hot dogs there are bagels and salads that will suit. The food came out quickly and we all tucked in. My extra sausage had been cut in half length wise which meant I was able to eat my hot dog without depositing it all over myself. Andy’s cubano looked delicious although one look at my hot dog and he decided that I’d won. Also of note was the lovely service: very friendly staff who scored extra points with me for taking the time to chat to the toddler. With most menu items coming in at under £4 and a different promotion for what seems like every day of the week (in addition to Cuban Tuesdays, Thursdays are Dog Pound day where an extra £1 will see you score an extra hot dog … you get the idea) this is a much more affordable way to eat lunch than, say, heading for a pub meal. If you’re out and about early enough, Primo’s will also offer you breakfast.